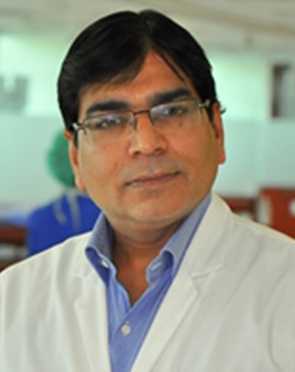 Dr. Hari Goyal had the privilege to work in best of Cancer Centers of India. He started his career in the field of Oncology at Tata Memorial Centre & did the prestigious course of DM from All India Institute of Medical Sciences, New Delhi.He is the head of Oncology unit comprising eminent doctors like Dr. Deepak Singla, Dr. Raman Kain & Dr. Smita B. Choudhury. The team effort gives an edge & advantage to the patients’ management.His practice has a major influence of teachings of pioneers in oncology, Dr. S.H. Advani, Dr. Vinod Kochupillai & Dr. Lalit Kumar. He has long associations with experts like Dr. P.K. Julka, Dr. Subodh Pandey, Dr. S. Hukku, Dr. Sudhir Bahadur & Dr. K.K. Pandey.His yesteryear colleagues are now prominent cancer specialists & are heading the cancer department of big institutions across the country and other part of the globe.His contribution to oncology is immense & has developed drugs for management of chemotherapy side effects. This development has helped millions of cancer patients since 2004. He was a part of large number of clinical trials of cancer research including one of the FDA audited trial. He has many prestigious awards to his credit which reflect his dedication, in- depth knowledge & collaboration with other departments to cure cancer.His communication, truthful discussions about outcome & energetic attitude is the key to his present success. Consistency, punctuality & empathy are some of his qualities which are admired by his patients & colleagues. A hard worker with a positive attitude towards the sick, he deals with all kinds of cancer. He has a passion for cure & control of cancer which make him an exceptional oncologist. His motto is to provide comprehensive & holistic treatment to each & every cancer patient.An expert of traditional drugs to recent advances, he is a hope, constant support & a friend of cancer patients & their families. He is adored by one & all. He is a versatile personality & a prolific writer. He is an expert of calligraphy & considered as a motivational guru by hundreds. Clinical research associate in protocol 94CE 32 .Phase III comparative study of combination treatment with TLC D99 liposomal doxorubicin and cyclophosphamide and doxorubicin in metastatic breast cancer. A Multicentric, open label phase III clinical trial to evaluate the safety of filgrastim in cancer patients with grade 3 or 4 chemotherapy induced neutropenia. Organizing secretary, 4th international seminar on psychosocial oncology, new delhi ,april 1999. TZ-01-002: A Randomized, Double-Blind, Multicentre, Parallel Group Study Comparing Two Humanized Monoclonal Antibodies that Target HER2 Receptors in combination with weekly Paclitaxel Administered as First-Line Treatment in Patients with HER2- Positive Metastatic Breast Cancer. SB3-G31-BC: A Phase III Randomised, Double-Blind, Parallel Group, Multicentre Study to Compare the Efficacy, Safety, Pharmacokinetics and Immunogenicity between SB3 (proposed trastuzumab biosimilar) and Herceptinu00ae in Women with Newly Diagnosed HER2 Positive Early or Locally Advanced Breast Cancer in Neoadjuvant Setting. A multicentre, randomized, open label, two period, two treatment, two way crossover, comparative bioavailability study at Steady state comparing Capecitabine Extended release Capsule 500mg (Intas Pharmaceuticals Ltd, India) to the reference listed drug Xeloda (Capecitabine 500mg ; Roche Pharmaceuticals) in patients of Breast Cancer under fed cond. A Phase III randomized, open- label, Multi-center, global study of MEDI4736 alone or in combination with Tremelimumab versus standard of Care in the treatment of First-line recurrent or Metastatic Squamous Cell Head & neck cancer patients. Member to many personal, professional & social organisations. Dr. Goyal performs 16 different procedures. Click on a procedure name to see more details and to view doctors for that specialty.